What better way to celebrate your company anniversary than to offer a promo gift! BHG is celebrating their 18th anniversary by offering a flash drive as a promo gift. This 4GB flash drive with leatherette cover can be redeem with a net purchase of S$180. BHG members only need a net purchase of S$150 to qualify. This flash drive comes in three colours: brown, black and red. BHG is a departmental store. It is recognised for quality, value and service. The company has 4 departmental stores spread across the island of Singapore. Establish under the Seiyu in 1994, BHG is a partner of the Beijing Hualian Group today. Why offer a promo gift for your company anniversary? Customer purchase is where most of the revenue of a company comes from. Sharing the joy of celebration with customers is the best way to reward them for their support. The best way to share this joy is to offer them a gift. 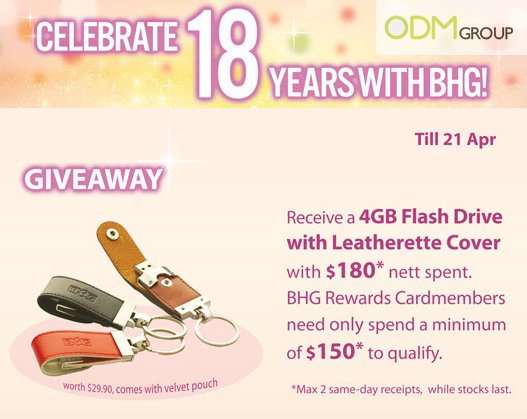 BHG is generous to offer such a premium gift. The flash drive is no ordinary one. It comes with a leatherette cover. The value of the gift is thus very high, and BHG is seen to be very generous. 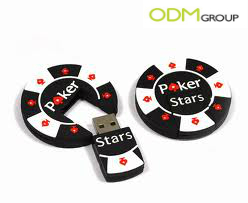 This flash drive with leatherette cover allows much room for branding. The logo of BHG is branded on the cover of the flash drive. Whenever the flash drive is used, the user would be reminded of BHG. This helps to form a deeper impression on BHG in the consumers mind. Start planning for your company anniversary by choosing a promo gift!